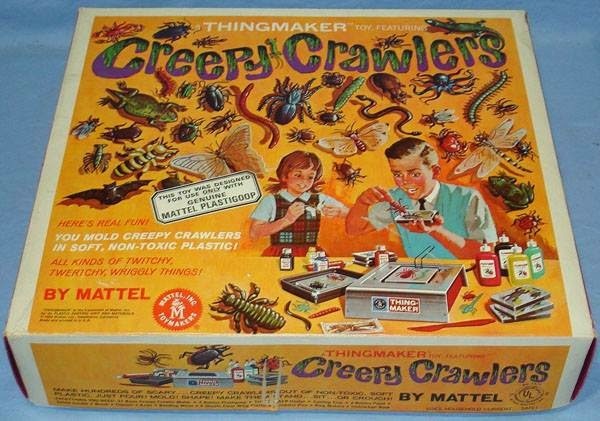 How many folks remember Creepy Crawlers, the molding/casting toy from Mattel which was used to make bugs, creatures, and even rubbery jewels with later sets? It was being sold in the mid- to late 1960s and was replaced in the late 1970s by the Thingmaker toy line. I know we had ours in the later 60s and on into the 70s and even used some of the (scale-wise) giant bugs as monsters for our tabletop roleplaying games and miniatures wargaming. You can read more here and also visit Dr. Goop's Creepy Crawlers website here.